When it comes to green technology, Audi is trying to cover all the bases. The German company has been selling its TDI diesels for a few years, and recently launched a trial program for its A3 e-tron electric car. Unlike other companies, Audi started with diesels and developed a hybrid, based on the A6, later. 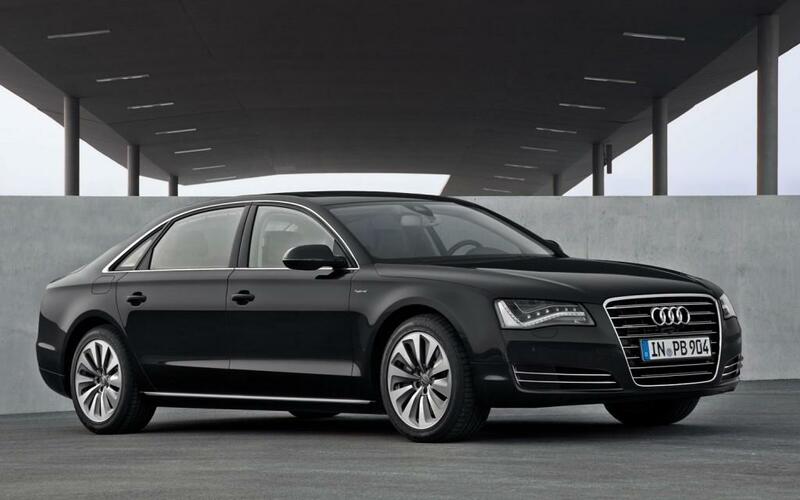 As a follow-up, a hybrid version of Audi’s flagship sedan, the A8, will go on sale in Europe later this year. The A8 hybrid will share many components with the smaller A6, including its powertrain. The gasoline engine is a 2.0-liter TFSI four-cylinder, with turbocharging. TFSI is Audi-speak for “turbo fuel stratified injection,” meaning the engine combines more efficient direct fuel injection with the turbo to get more power from less displacement. In this case, that means 211 horsepower and 258 pound-feet of torque. Mounted behind the gasoline engine is an electric motor with 54 hp and 155 lb-ft, giving the total system 245 hp and 354 lb-ft of torque. The electric motor is powered by a 1.3 kWh lithium-ion battery pack, and is connected to the rest of the drivetrain with its own clutch. Power is sent to the front wheels (no quattro all-wheel drive here) via an eight-speed automatic transmission. Audi says the A8 hybrid can drive at speeds up to 62 mph (100 kph) on electric power, or go two miles at 37 mph. The company says the big hybrid will get 37 mpg, much better than the 21 combined mpg of a regular A8L, which has a 4.2-liter V8. When it hits European streets later this year, the A8 hybrid will have plenty of competition. The conventional A8 competes with the BMW 7 Series, Mercedes-Benz S-Class, and Lexus LS, so the A8 hybrid will compete with the BMW ActiveHybrid 7, Mercedes S400 Hybrid, and Lexus LS600h L. If the A8 can achieve Audi’s claimed fuel economy, it will easily beat all three: the BMW and Lexus are rated at 20 combined mpg, the Mercedes at 21. Of course, the A8 rival’s use bigger gasoline engines. The Mercedes has a V6, the BMW and Lexus have V8s. That gives them more power to deal with their massive weight. A non-hybrid A8 weighs over 4,000 pounds; that’s a lot of weight to move around with a four-cylinder and a small electric motor. 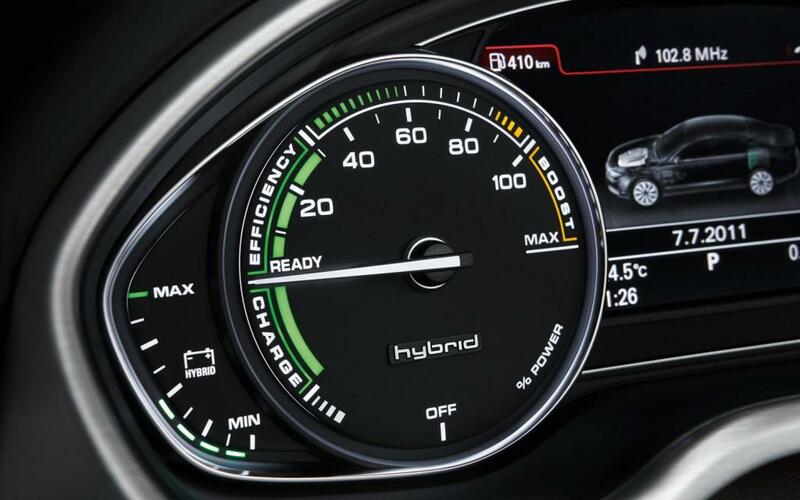 Audi did not release any performance statistics, but the A8 hybrid may be less dynamic than its rivals, even if it beats them in fuel economy. All this is hypothetical for Americans, since the A8 hybrid won’t be coming here anytime soon. Instead, Audi is going to introduce the A8 3.0 TDI this fall. This diesel car reflects Audi’s old strategy of emphasizing compression ignition engines over hybrids, and will be the perfect flagship for a range that includes the A3 TDI. After all, it’s great to try new things, but it’s also good to have something familiar to rely on.